Everyone shut up, sit down, and let me tell you about the best part of Harry Potter and the Cursed Child. It involves a character you have probably never paid attention to, who turns out to be the most terrifying entity in the entirety of the Wizarding World of Harry Potter. Hey, kids, remember the kind old lady puttering around the Hogwarts Express selling treats to Hogwarts students? She is also the train’s security. She was hired in 1830 by the Minister who got the Hogwarts Express built and she’s stuck around for nearly two centuries feeding kids and keeping them on the train. She’s been doing it for so long she doesn’t remember her name. But she’s never let a kid get off the train. 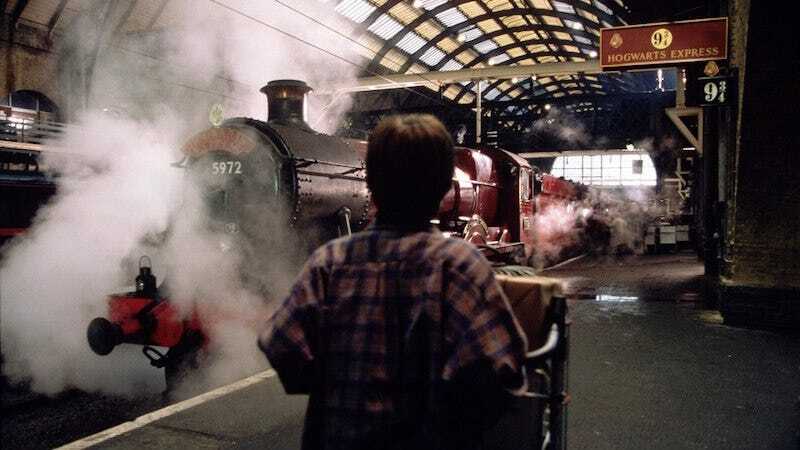 Now, because the world of Harry Potter is an endless cycle of things that should be terrifying but have been normalized by centuries, the way the Trolley Witch keeps her charges on the train is fairly disturbing. I love this development. It is exactly the kind of hilariously ridiculous thing that made me love Harry Potter in the first place. Also, the witch is described in the stage directions as “Her hair wild. Her spikes particularly spiky,” which is amazing. I really have missed having more Harry Potter stories.